"Guess the one with the fake smile"
Sorry guys. Baked beans for lunch. Davis beamed with glee as his followers told him how good his speech was. Other parties remained silent. 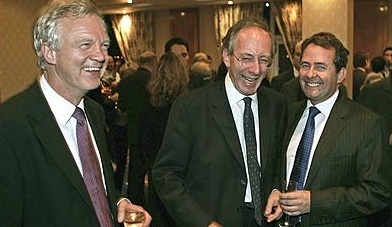 David Davis, Sir Malcolm Rifkind and Liam Fox respond to Edward Leigh's announcement that he expects to win the forthcoming leadership contest. And you think that speech will win you the leadership? "We can relax now. It's not going to be one of us"
"What's so funny, guys?" Davis asked, unaware of the "Kick Me" sign taped to his back. Did you know chaps, Ken Clarke is claiming to be the man to unify the party. David Davis misunderstands the response when he asks two of his rivals what they thought of his speech. Did you hear the one about the four dogs and the blackbird? DD: "I'm the unity candidate"
MR: "Yes, David, we are all in complete unity about your speech...."
Davis: "I know we're all laughing now, but when I said you'd be better staying at home I really meant it."